Hop flavor, aroma and bitterness all are pronounced, but harmoniously so. The character is a complex amalgam of fruit, herb and spice notes. The hop inmates have taken over the beer penitentiary. Hop hedonism reigns. Malt, yeast and water were not on the party invite list. This bash, and this brew, are all about hops in a state of complete HAVOC. The kanji depicted (混乱 – konran) literally mean havoc or bedlam. 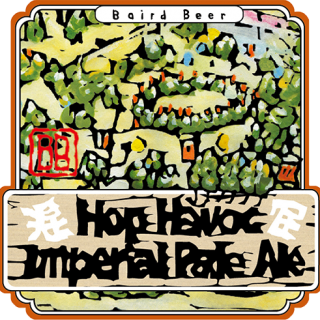 Hop Havoc has the starting gravity of a strongish Pale Ale, the alcohol content of an IPA, and the bitterness units (as well as dry-hop aroma) of an Imperial IPA. It thus is a sort of hybrid of these familial styles. We’ll call it an Imperial Pale Ale. The hops we use are all bold and pungent varieties. I am a big fan of blending several varieties in order to achieve a more unique and complex hop character. Hop Havoc is triple dry-hopped using all six hop varieties. This serves to heighten the intensity of the aromatic experience. We also krausen Hop Havoc at packaging with a peak fermentation batch of our Rising Sun Pale Ale. This final step keeps the beer alive and evolving and helps the hop character to remain piquant and fresh in package.